The PowerPallet is a new and unique "bolt-on" device that will instantly convert any standard major brand manual pallet jack into an ultra-compact motorized pallet jack. This revolutionary, multi-patented invention consists of a powerful, battery operated compact drive unit and throttle assembly that can be connected to any major brand or standard pallet jack. Economical - Inexpensive to purchase and inexpensive to maintain. Compact - Virtually the same size as your manual pallet jack, with the same small turning radius. Easily Customizable - Customer can easily program the PowerPallet to meet their specific needs! Choose Between 6 speeds settings and 6 horn safety settings. No Down Time - Compact, lightweight, and easy interchangeable battery, allows you to have spare batteries charging while using your unit ensuring no down time! Versatile - Turn those special custom pallet jacks and and non-standard sizes that are not available with a motorized option into a motorized pallet jack! Improve the productivity and safety of your pallet moving operations while maintaining a consistent operator interface regardless of the age/brand/condition of the pallet jacks in operation. PowerePallet powered drive units also represent unprecedented value with a low purchase price, minimal maintenance costs and the benefit of having “multiple lives”. Also available here with complete Pallet Jack. • 1 Battery Pack (You can also purchase additional batteries if required). Have a look at this video demonstrating the PowerPallet in use as well as assembly instructions. For more details you can also see the complete manual here. time the machine auto powers off. manual horn; usage logging and more. in use, greatly improving battery performance. attachment of the PowerPallet to an array of popular pallet jacks. PowerPallet sees a much longer service life at a lower acquisition and annual cost. with no mechanical or electrical experience or special tools required. The PowerPallet has been designed and built to be virtually maintenance free. The pallet jack that we recommend this kit for is the Crown PTH50 or one of the others listed under the Technical Details tab above, as there will be no need to fill out all the specs of the pallet jack you will be installing the kit on, since we will already know the specs of that pallet jack, and we can ensure that the kit will fit on those jacks. For other pallet jacks see below. 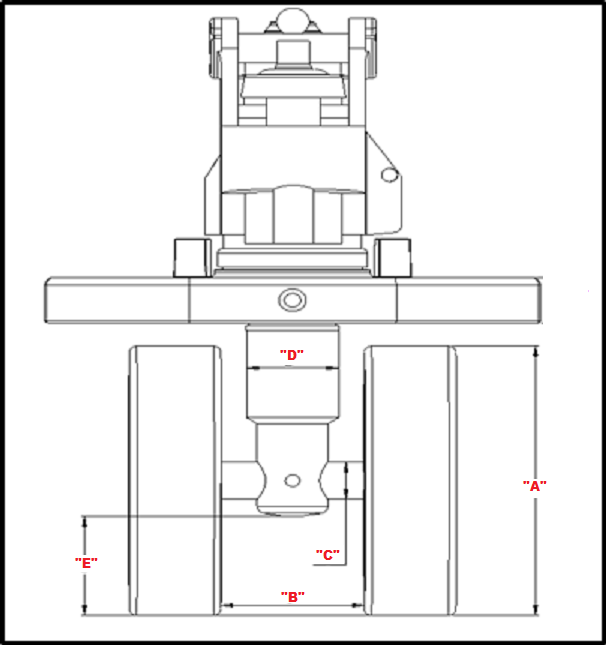 In order to ensure that you receive the appropriate fittings for your pallet jack, we will need some information that can be filled out when ordering. Please specify your current Pallet Jack - Brand and Model, as well as the points shown below. There are also some limitations as you will see. G) We can only accomodate non-articulating axles. 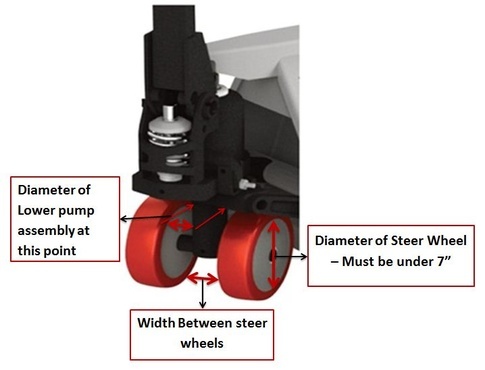 Assume that you have a non-articulating axle unless you know otherwise, as the articulating ones are very rare (they feature an independent suspension for each wheel). Important: When measuring the diameter of the lower pump assembly, if your pump tapers down, please make sure to give us the diameter of the widest point. Some handles, like the old Multiton, Bishamon, and BT jacks, have a unique handle design that will not accomodate the PowerPallet kit. 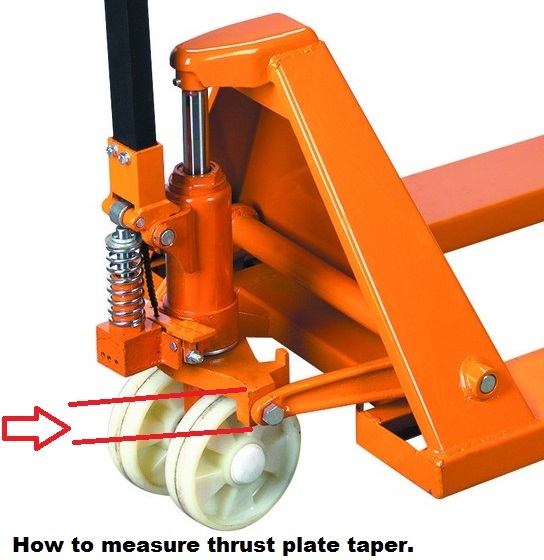 Pallet Jacks with brake levers or other devices, also can not accomodate the kit. See detailed images for handles that will not work. If you plan on using the kit on a pallet jack servicing a refrigerated truck, please call us to discuss first, as it will not be compatible with the slatted style refrigerated truck floors. The unit went on our manual jack easily and fairly quickly. The driver delivered 18 stops before the battery started showing yellow. Advantages: The driver does not have to work as hard to deliver the product. It does not add much weight to the jack and it costs much less than buying a regular electric jack. The small battery and charger can easily be charged in the truck over night because our trucks have APU's.